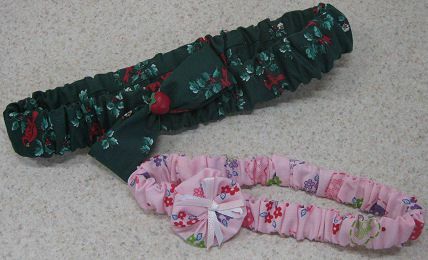 This headband features fabric that is scrunched similar to a scrunchie hair tie. It is simple to make and uses up scraps of fabric so you can make one to match any outfit. Decorate your finished headband with a fabric bow or other embellishment to make it extra special. If you are making the headband for a child with fine silky hair, consider using a narrow elastic so the headband can be held in place with children's barrettes. Measure the head of the person who will be wearing the headband, in the area of the head that the headband will be worn. Depending on the stretchability of the elastic you are using, subtract just enough to make the elastic snug on the head, allowing for the ends of the elastic to overlap by 1/2". Do not make the elastic so tight it is uncomfortable. The Length equals -- The length of the elastic times 1.5 (times 2 if you are using a very fine fabric)plus 1/2" for turning under at the ends of the fabric tube (later in the directions). On each narrow end, fold under (so wrong sides of the fabric are together) 1/4" and press well. Fold the fabric in half lengthwise, with the right sides of the fabric together. Align the long edges and pin them in place. Sew the long edge using a scant 1/2" seam allowance. Fold in 1/4" on each of the ends of the tube so the raw edges are inside the tube. Press them in place. Thread the length of elastic inside the fabric tube, using a safety pin or bodkin. Sew the ends of the elastic in place by overlapping the ends of the elastic and machine sewing them together to secure them. Tuck one end of the fabric tube inside the other end, overlapping the tucked under ends. Hand sew or machine top stitch the ends of the fabric tube in place. Hand sewing will give you a smoother junction than machine top stitching. Placing a decoration on the headband, off center from the top center of the headband, will add interest to the headband. If you will be making this headband for a small child, Always tightly secure anything that a child will wear to prevent any choking hazards. Button and Carpet thread is a strong thread that should securely hold any decoration. Create a bow (Create Fabric Ribbon and A Hair Piece Style Bow) and attach it to the headband. Fold the headband in half so one of the folds are where the fabric and elastic are joined. Bring the mark and the seam junction together to fold the headband in half again. Find the halfway point between the mark and the new fold and mark the location. Design a decoration to place on this final marking on the headband. Create a fabric yo-yo in a size that is just larger than the headband. Place the gathered side up and place a decoration on the center of the yo-yo. Layer different size yo-yos for a different effect. Place ribbon bows or buttons in the center of the yo-yo. Decide the size of the bow you want to make by using a tape measure folded in a bow form. Add 1/2" to the desired measurement of the tape measure. Decide the width of the bow, double the width and add 1/2"
With right sides together, fold the length of the bow fabric in half, aligning the edges. Sew the long edge using a 1/4" seam allowance. Turn the tube right sides out and press with the seam centered on the back of the tube. Bring the narrow ends of the fabric together to form a loop. Overlap the ends and sew them together. Measure the distance around the loop. Decide how wide you want the center of the bow, double the desired measurement and add 1/2". With right sides together, fold the center in half, aligning the edges. Using a 1/4" seam allowance, sew the seam that is the distance around the bow. Turn right side out and press so the seam is centered on the back of the strip. Wrap the strip around the bow loop with the seam toward the fabric of the loop. Pull tightly if desired to gather the center of the bow. Overlap the ends of the center loop and hand sew them in place. Optional- Create graduated lengths of the bow loop, making the next loop a bit smaller, and stack the loops before sewing the center loop for a different effect. You can also make the last bow loop small so that the center loop can go inside the loop to hold the bow loops together. Experiment with trims, eyelet, different bows and lace to obtain different effects.